The ‘vine-that-ate-the-south’ has a foothold on Old County Road, Pin Oak Circle. The southeastern United States has long dealt with kudzu. Commonly referred to as the “vine-that-ate-the-south,” kudzu grows rapidly and can blanket entire landscapes. 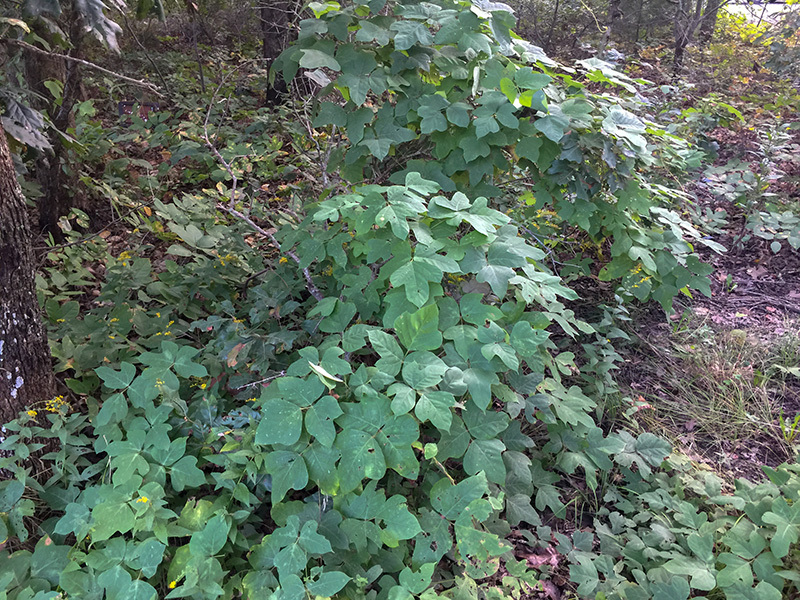 West Tisbury selectmen learned Tuesday night kudzu was discovered at the intersection of Old County Road and Pin Oak Circle. 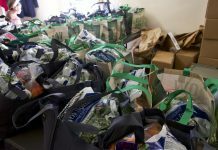 “Apparently we have a problem,” selectmen chairman Cynthia Mitchell said. “Yes, you have a very invasive — dangerously invasive weed — in West Tisbury on Pin Oak Circle and it’s going to be a problem if we don’t kill it,” tree warden Jeremiah Brown said. 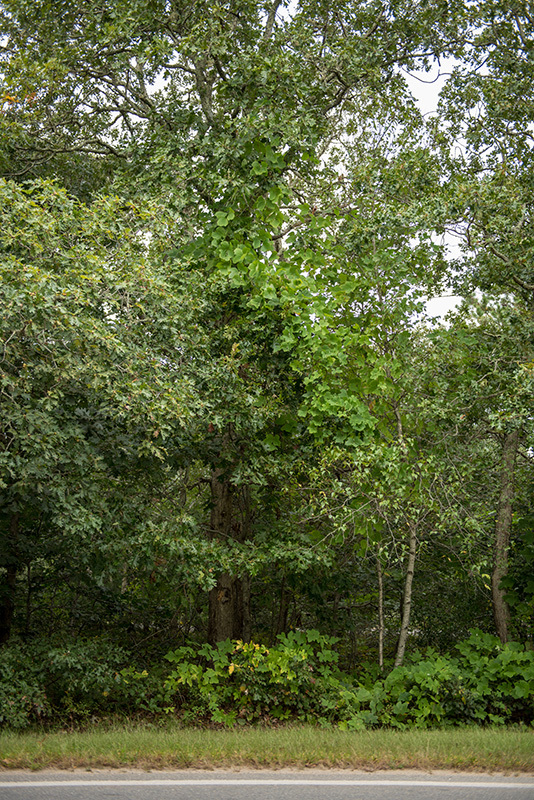 Homeowners (Marsha and Donald Macgillivray) are willing to try new measures to eliminate the vines with the caveat that West Tisbury do its part as some of the kudzu is on the shoulders of Old County Road and Pin Oak Circle, Brown said. Town manager Jennifer Rand witnessed the scourge of kudzu on a recent trip. “Down there they call it the vine-that-ate-the-south,” Brown said. Brown told the board he read it is taking over 120,000 acres a day down south. Rand said she contacted the state and learned it has no program to help with the elimination of infestations. The selectmen deemed the matter urgent and authorized Brown to draft a bid package and send it out to select contractors. They also authorized him to speak with the homeowner so the town can come to an understanding with them about cost sharing for the overall work. Kudzu is has been found on the Cape, the South Shore and the North Shore. Felix Neck director Suzan Bellincampi told The Times she learned of a patch on Snake Hollow in Vineyard Haven that has since been left unchecked. 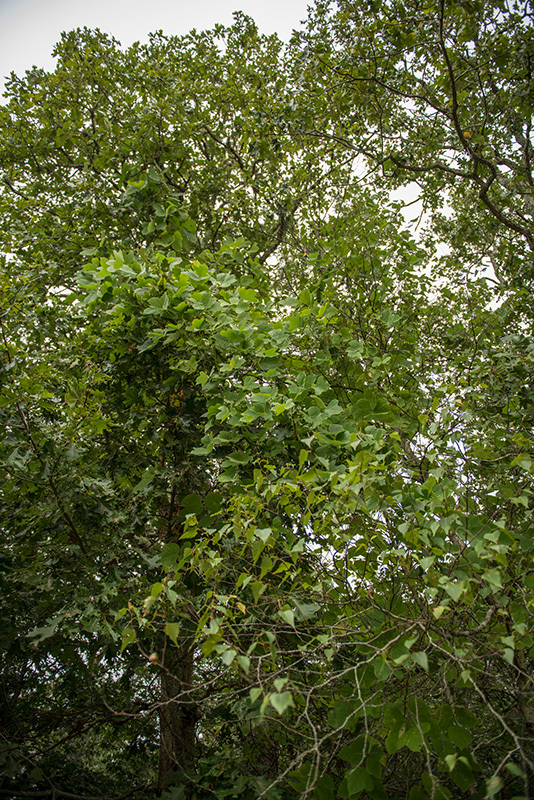 While grape, porcelain berry, bittersweet and Japanese knot vine grew prolifically in places along Snake Hollow, The Times could not locate any kudzu. 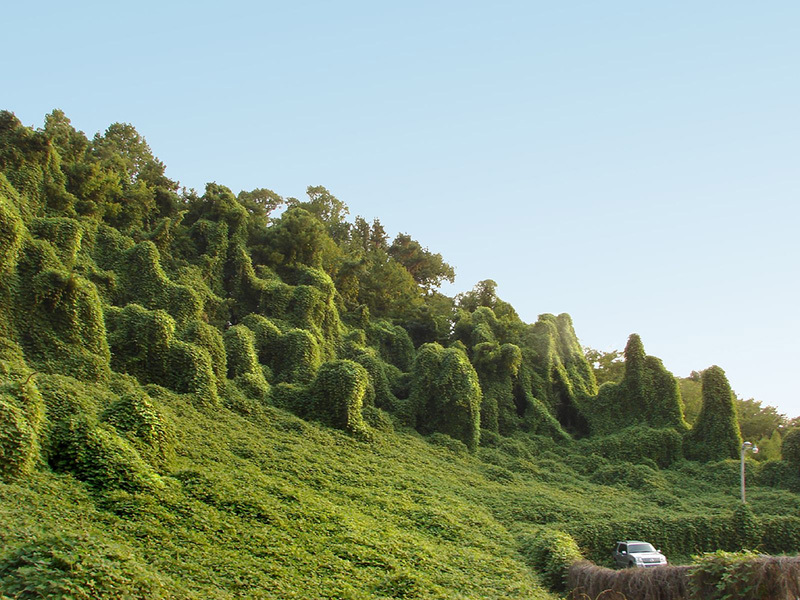 “The invasive kudzu can easily overtake trees, abandoned homes, cars and telephone poles,” according to the Nature Conservancy. “Some call it amazing, others call it a menace. Either way, kudzu — a creeping, climbing perennial vine — is an invasive species that is terrorizing native plants all over southeastern United States,” one of its webpages states. “Kudzu’s darker side surfaced in the early 1980s, when Atlanta actually declared out-of-control kudzu a misdemeanor,” Martin J. Smith wrote in the book “Oops: 20 Life Lessons From the Fiascoes That Shaped America,” which he co-authored with Patrick J. Kiger. Smith offered a telling example of how intimately disastrous introduction of kudzu to America was deemed to be. Like Dutchman’s pipe and wisteria, kudzu was also considered a pleasant porch trapping. Joseph Neal, a professor of weed science at North Carolina State University, told The Times the indestructibility of kudzu is overblown. “Actually that’s a bit of a myth,” he said. When the situation in West Tisbury was described to him, Neal said both the private property owner and the town need to effect a solution or the vine will continue to encroach. “You have to control the entire infestation. This is a perennial weed that persists with a very thick root,” he said. Neal said the 1-foot a day notion is not apocryphal but not standard either. “Under absolutely ideal conditions it can push up to a foot a day on the vine,” he said. Inches a day is a better metric, he said. Unmanaged southern sites are where the vine gets out of control and blankets, he said.If a property is well managed, kudzu isn’t problematic. At New England’s growing climates, Neal suspected kudzu seedlings would be hard pressed to survive cold weather and therefore dispersal by seed is questionable. Soil up from southern states of other areas where the vine is prevelant, soil containing kudzu plant matter, is a possible answer to how it came to grown on the Vineyard, he said. “If you can imagine ways that soil can move, you have a myriad of possibilities,” he said. Left unmanaged, the vine tends to smother everything around it. 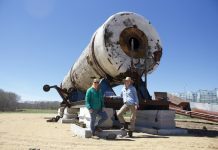 “It will grow right up over the top of almost any plant in the area,” Neal said. The trees it kills can then become topple dangers,he pointed out, especially in storms when the added surface area of the vines acts like a sail. Herbicides can kill the vine, he said. 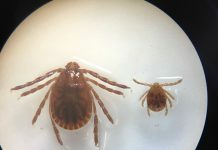 In more sensitive areas, there are workable control methods as opposed to eradication methods. Neal advocated the ounce of prevention is worth a pound of cure philosophy. Donald Macgillivray said kudzu appeared on their property “about two years ago.” Neither he nor his wife Marsha know how the vines came to be there. A Little Sheep Goes a Long Way in Managing Kudzu.